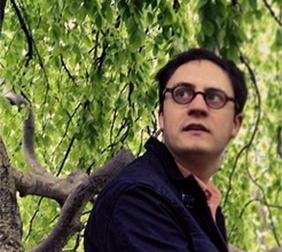 When I was fourteen, I fell through a hotel window in Russia. It’s a story I have told countless times. The details were chosen almost immediately afterward and the beats have been laid down through repeated telling. The experience no longer exists in my memory as anything other than this story; when I retell it, I remember images only as I’ve described them. 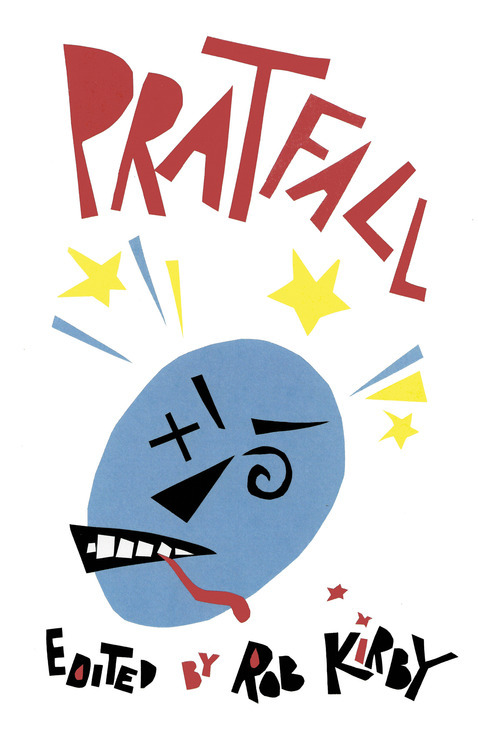 When Rob Kirby asked me to submit a short comic last year to his new anthology, Pratfall, the Russian window incident sounded like the perfect candidate. But as I sat down to draw it, I realized that I had to change the story. I don’t mean that I had to change what happened, but I had to translate a story told from direct experience into comics. First, I had to decide what my appearance would be. 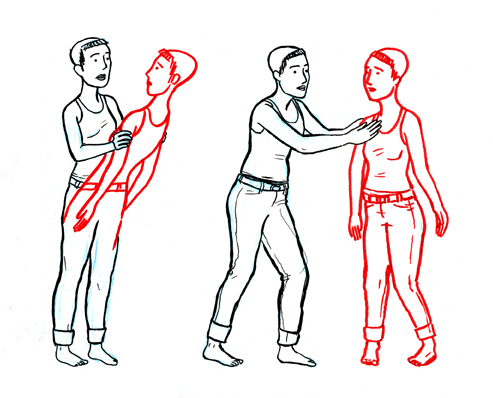 And then I had to draw this character moving through space as if it had all happened to someone else. I certainly don’t remember watching myself hop over a balcony railing, so I had to invent what it might have looked like. And the emotions I felt needed to be transformed into facial expressions that I never could have witnessed. In order to retell my story, I had to extract myself from it. “I experienced this,” is the stance taken by traditional prose memoirs. 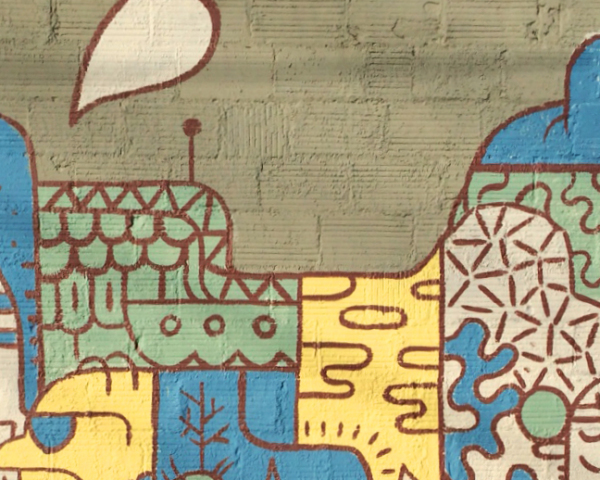 As readers, we accept the alteration of some fussy details for the sake of simplicity and the conflation of different characters for the sake of craft. Our acceptance is supported by a trust that the memoirist has presented a narrative as close to her experience as possible. Because the first-person narrator takes a similar form to the one heard at the dinner table, we trust her implicitly. If readers learn that the experience never happened (James Frey being the most famous example in recent years), they can feel betrayed, as if they’d been lied to. When the experience is no longer real, the narrator of the text becomes someone other than the author, which can be problematic for autobiographical writing. Putting aside the question of whether an autobiography can ever be “true,” the experiences described are expected to be honest. Something happened to me. I did something. I felt something. 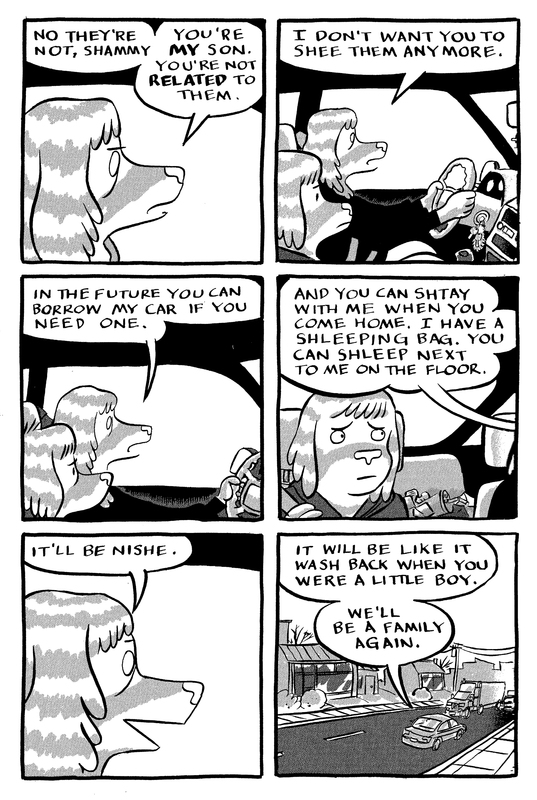 On the other hand, the “I” in autobiographical comics is visibly displaced from the start. 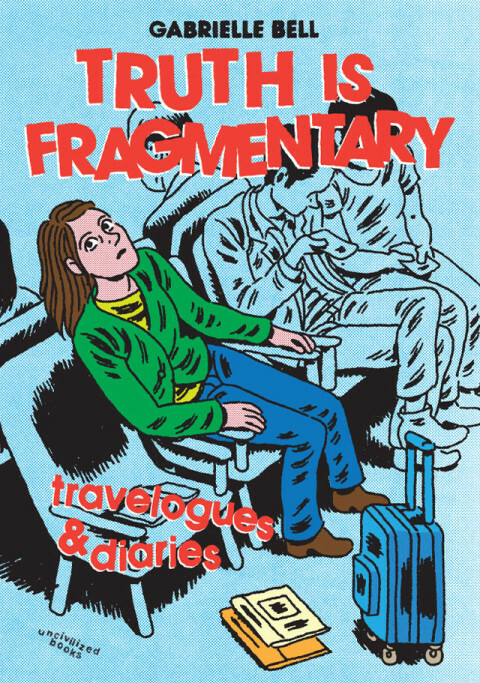 Commonly, autobio and diary comics include a first-person narrative, but the narration invariably supports a drawn story about a character who represents the author. That character exists in a space invented by the artist but never experienced by him. Comics can be drawn from a single character’s direct perspective but, as in film, it’s rarely done and it limits the artist’s visual vocabulary (I’m not even sure a first-person narrative can exist in a visual medium; even the first-person shooter videogame genre behaves more like a “second-person shooter”). 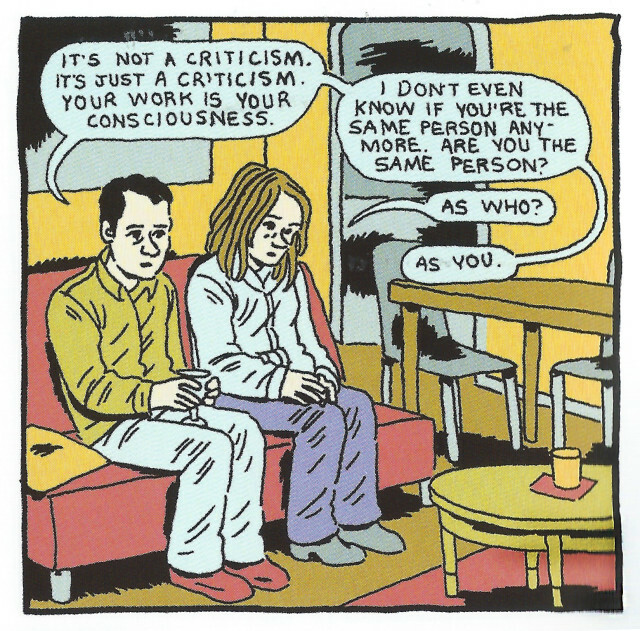 So the natural perspective of comics is the third-person. 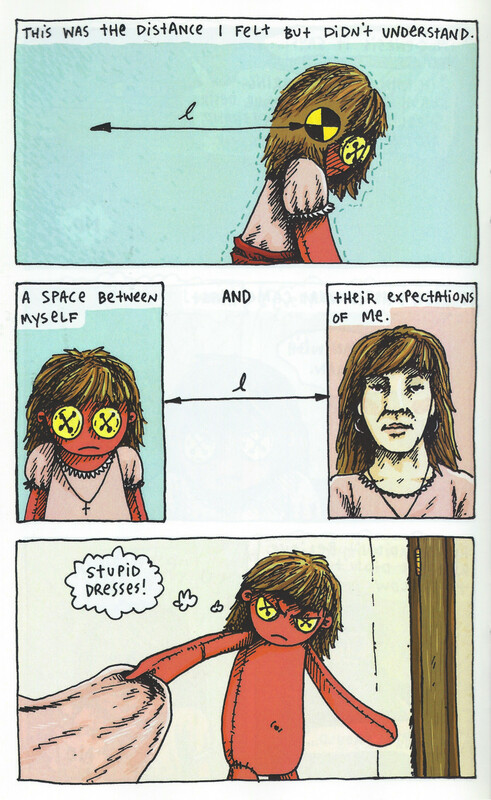 In autobio comics, the “I” of the prose memoir provides an interior life for the “I” drawn in the panel. Something happened to this person. This person did something. This person felt something. Drawing the self as a separate character allows the artist to present a persona that is beyond a representational self-portrait. 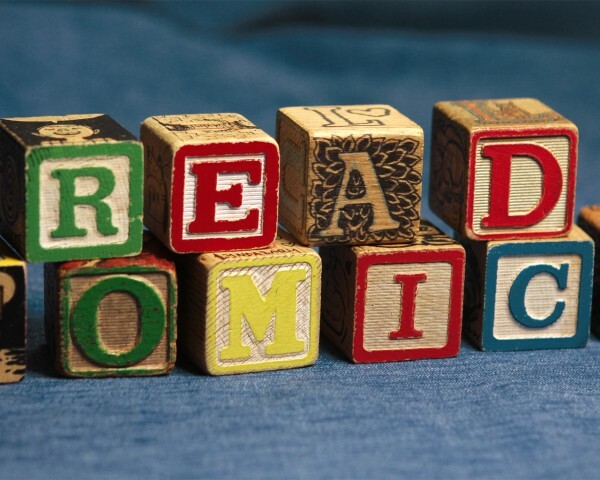 Sometimes the simplification of the persona allows the reader to identify more easily with the author; John Porcellino’s persona is a nondescript figure who wears a hat, while Liz Prince’s persona shares the easy accessibility of a Peanuts character. Simplification is an effective practice because the access works both ways; not only can a reader more easily identify with the author when drawn as an “everyman” but the author may more easily inhabit this character as well. The artist can no longer relate directly with the scene but she can project herself onto this simplified persona. Without the baggage of firmly detailed features, she creates an easy entryway for herself. Other artists have used their personae to support the emotional realities they are trying to depict. In Flocks, L. Nichols describes being a girl who is confused about her gender and sexuality inside a strict religious community. 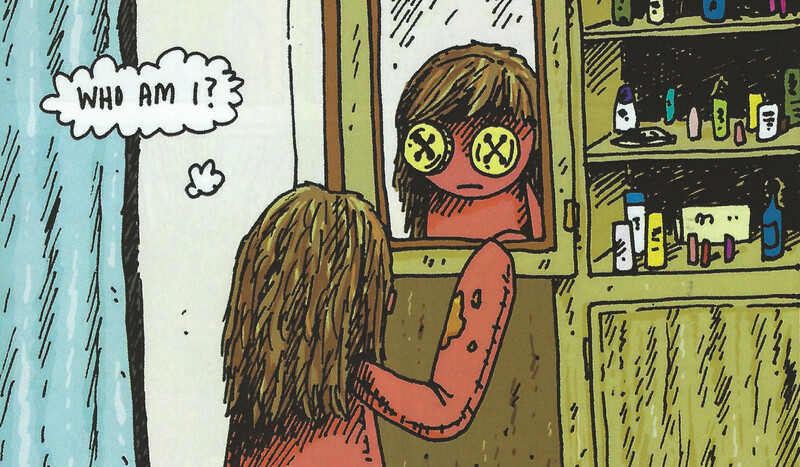 Nichols’ persona is a rag doll with button eyes that emphasizes the transmutability of her gender while placing her firmly outside her family and community. There is a gap between the feminine expectations everyone has placed upon her and the bearded Russian man she wants to be. 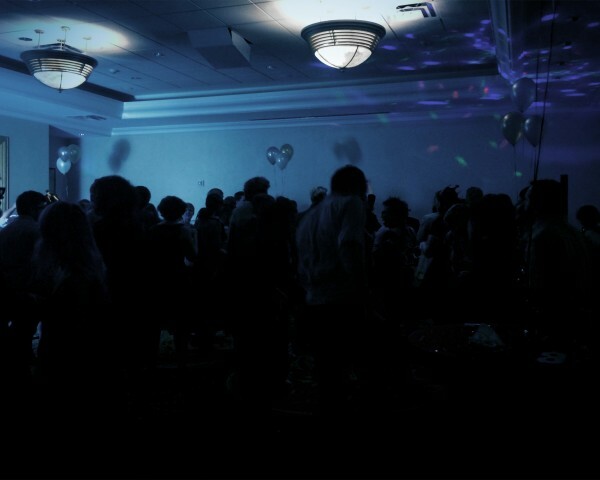 In the context of the church and her community, she feels like a “freak,” a “queer,” and someone who only feels a sense of belonging when she removes herself from their gaze. 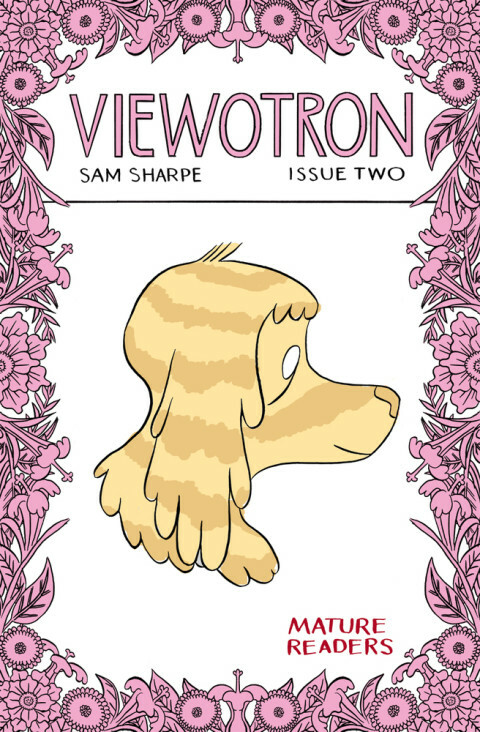 Sam Sharpe chose to depict his damaged relationship with his mother using animals in his comic called “Mom” (Viewotron #2). In keeping with the tradition of funny animal comics, the animals walk upright, wear clothes, and are otherwise human. By portraying himself and his mother as dogs, Sharpe finds a distance that allows him to tell a difficult, personal story. In his essay, “Animal Subjects of the Graphic Novel,” Michael Chaney describes the funny animal as “a clown, a downright virtuoso at playing the ludic cipher of otherness. Its appearance almost always accompanies a strategically parodic veiling of the human. 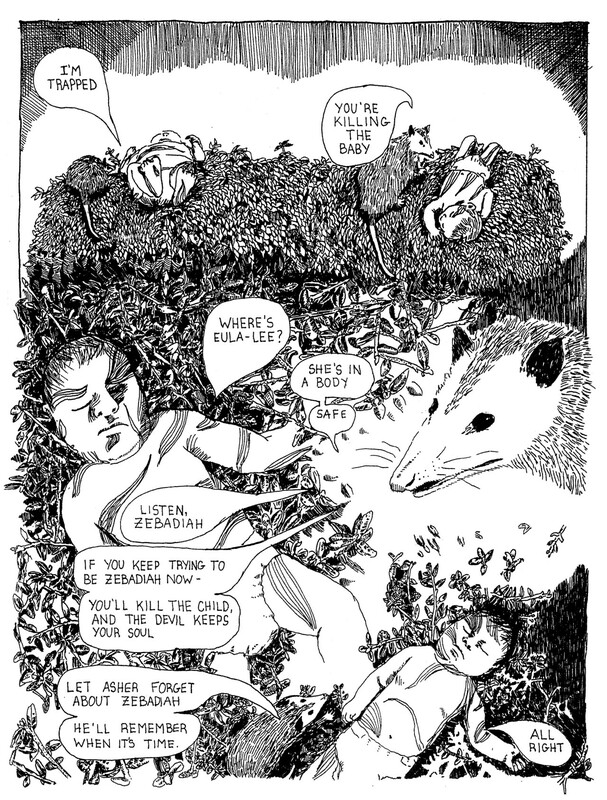 The illustrative style of such comics defamiliarizes visually.”Note Although Sharpe’s persona is not a metaphor (as in Nichols), the use of animals presents the story of his mom’s schizophrenia as a heartbreaking parody of a mother-son relationship. Perhaps no one has embraced the distance between the cartoonist and his persona like Asher Z. Craw. In the first issue of Zebadiah, we are introduced to the titular mountain man and we follow his confrontations with urban society. Craw then places himself as a character in the second issue and eventually merges his character’s identity with Zebadiah’s. Zebadiah’s soul is transmuted into Craw’s female body at birth, and the quest to save his soul is left to Asher to “find” Zebadiah inside of him. By depicting the mountain man first, Craw effectively presents his “true self” to us before we have any idea of its autobiographical import, building a powerful metaphor for the transgender experience. 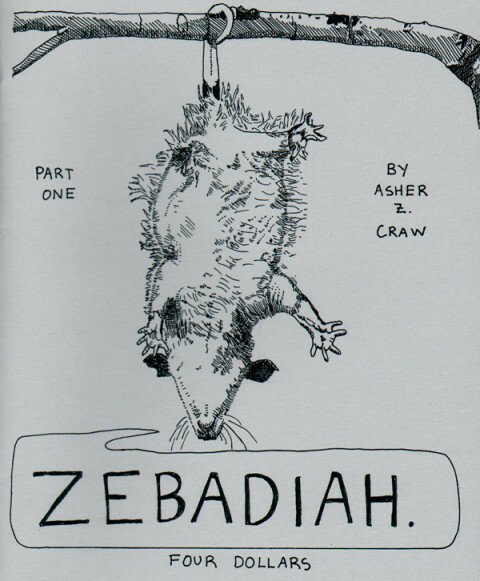 Craw pushes his persona as far away from his life as he can – Zebadiah has a different appearance, history, family, career, and he lives in a separate place and time – and then Craw identifies with him completely, telling the reader that he is this fictional character. To understand Asher, he says, you must first empathize with this construct. 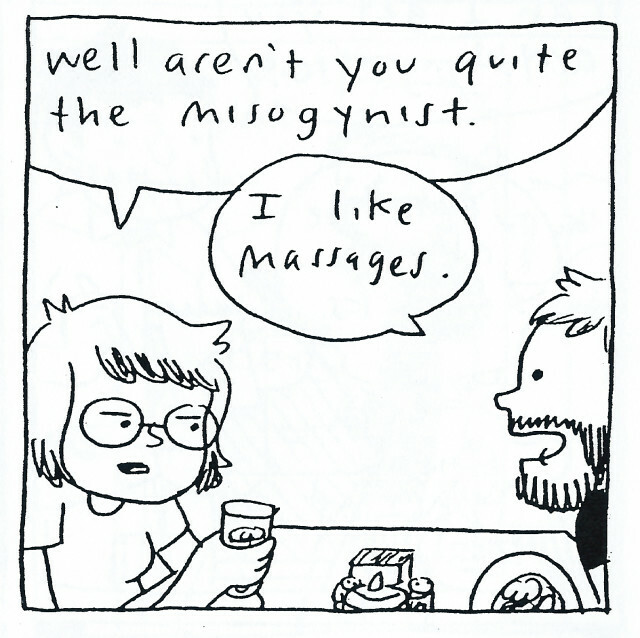 Gabrielle Bell loads her comics with specificity. 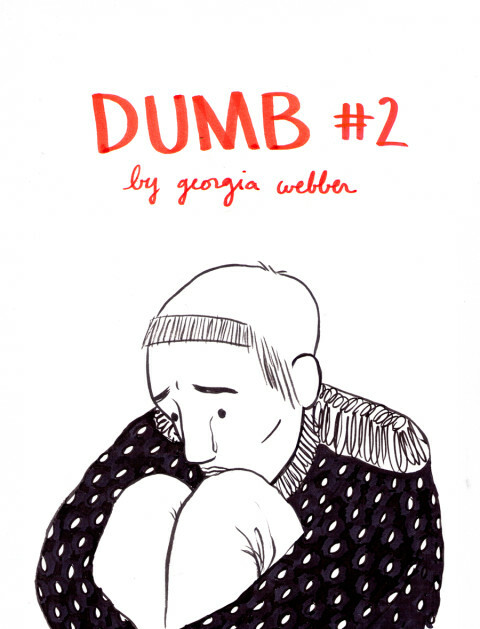 Her comics persona is a direct illustration of detailed diary entries, which are often straightforward accounts of chronologically dated events. She tells us exactly what happened and how she felt about it. Occasionally, her narration dips into fantasy; when feeling pressure under a deadline, for example, she imagines national anticipation for the work, heightened by a past nonexistent bestseller, leading to an imaginary press conference. She depicts sleeping dreams and daydreams, anxieties and fears, all with the same constant, even-keeled narrator. 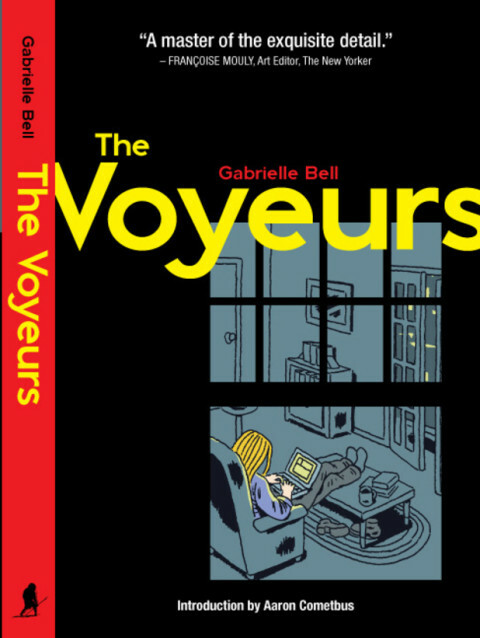 While Gabrielle’s character may be emotionally distraught, Gabrielle’s narrator is calm, detached, and perceptive – an observer to her own life. In her account of the Festvial Entreviñetas (Bogotá & Medellín, Columbia, September 14-22nd, 2013), Bell writes from the point of view of an unnamed, fictional secretary she has hired to depict her experiences. The secretary’s depiction of “Miss Bell” is no different than it would be otherwise; the subject matter is familiar ground and she has the same access to Bell’s inner thoughts and emotions. Her invention of the secretary (who does have some side adventures of her own) highlights the fictional nature of Bell’s standard narrator. Both are constructed observers and commentators to her thoughts and actions. She “hires” the secretary, she explains, so that she has the opportunity “to participate more fully in the life around [her],” a goal that is challenged by the blurring between a life lived and a life observed. In her August 11, 2007 entry, Michel Gondry comments on her decision to jump in a cold lake: “You’re just doing this for your journal, aren’t you?” She doesn’t deny it. After years of narrating her experiences, the narrator now influences the choices her character makes. This interplay between observer and subject is articulated through her friend Tony in her short comic, “Sa Vie,” in a series of metaphors that describe a person who is only partially present: a shifting cloud, a long snake, an airport. “Talking to you is like visiting someone at their work,” he says. She seems to live a postmodern life: a writer who is aware that she is also her character. After a tense night spent in an unfamiliar country far away from home, my friend Nick and I discovered that our hotel balconies were connected. Armed with this secret insight, we thought it would be funny to tap on our friends’ windows from outside and wave to them. I tripped on a railing, fell through a window, and everyone freaked out. The story was my experience: I was silly, I was clumsy, I was scared, and then I was ashamed. The process of drawing it transferred these emotions to my comics counterpart. “I” was now the narrator following this other character around. Adjusting my perspective allowed me to change the scope of the story. We were a group of American teenagers visiting Russia right after the end of the Cold War. They called us “student ambassadors” and sent us to a grade school, a military camp, a youth summit with Gorbachev, among other activities. I wondered what kind of “ambassadors” we were. How did they view us? It is easy to see why detaching yourself from your experience can give you a new perspective. But what surprises me now is that the process of learning to draw my experience led to a story about perspective. 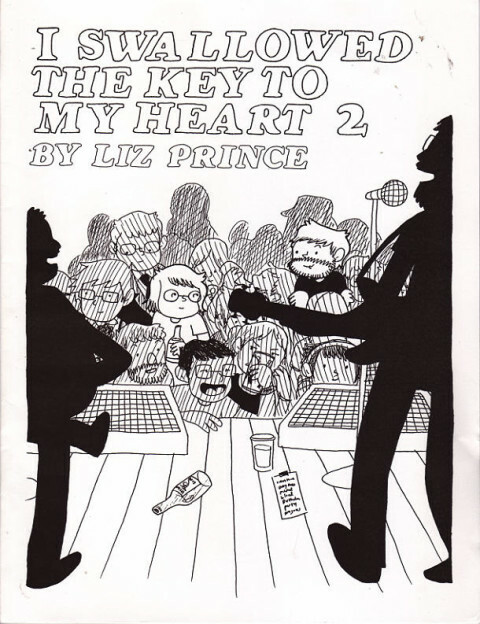 It was the nature of autobiographical comics that led me to my comic’s theme. Perhaps now that I’ve already translated my memories into drawings, another autobio comic would find a different insight. But maybe that friction is unavoidable. I am the character of the story, I am the narrator of the character, and I am the author of the narrator. 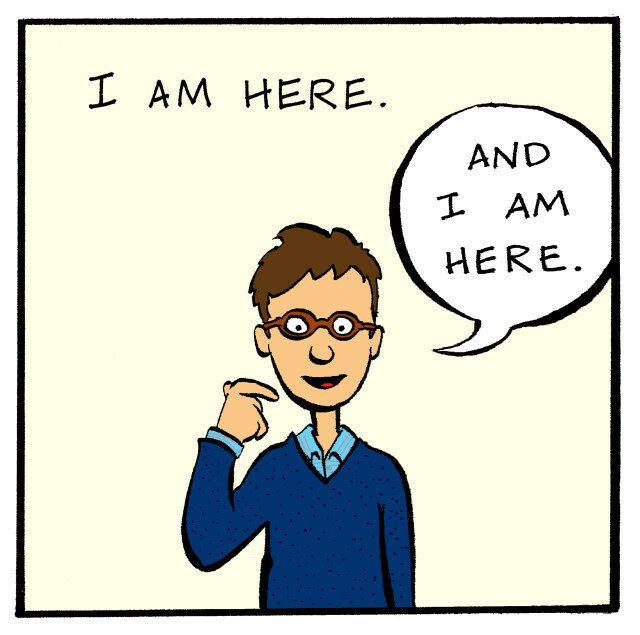 I am here. And I am there. Chaney, Michael A. "Animal Subjects of the Graphic Novel," in Drawing from Life: Memory and Subjectivity in Comic Art, edited by , 1000 – 1400, edited by Jane Tolmie, 44-66. Univ. Press of Mississippi, 2013. Further reading: John Porcellino, Sam Sharpe.